Ashley possesses that self-deprecating type of humour that is the hallmark of many a lower league fan. As we chat about his time supporting Bradford City, during the club’s opening pre-season friendly at Farsley, he jokes, “I’ve seen the worst of times: I went to Oldham last season“. On 11 December this year, Ashley will celebrate his third anniversary as a Bradford City supporter. Back in 2012, in his mid-20s, he was reluctantly persuaded to attend a City match by his close friend and long-standing season ticket holder, Tim. It just so happened that Arsenal were the opposition – you might remember it. In no time at all, Ashley was hooked and now follows the team home and away. “These days, it’s him badgering me to go to away games,” chuckles Tim. In my day job, Chris is one of the most senior managers in an organisation that employs more than a thousand people. A few years back, I remember him delivering a stirring conference speech to every manager in the company about the importance of leadership, where he cited Sir Alex Ferguson as a great example. These days, he’d be more likely to use Phil Parkinson as his case study of an effective leader. Not only will you find Chris and his two boys sat near the front of the Kop every home game, you will spot them at away matches up and down the country. “City is the main topic of conversation in our house and we’ve even persuaded my wife to come along occasionally,” reveals Chris. “Both boys were mascots for the Bristol City game in January 2014 and we were still at pitch side when James Hanson scored his 49-second opener and promptly ran across to celebrate with us. Back in the office, Chris will come and talk to me often about Bradford City matters. As we chat, my own manager – a Manchester United fan – always looks on perplexed. Chris adds, “Even though the boys have been to Old Trafford, they both prefer the down-to-earth feel of Valley Parade and the accessibility to all the players and management. Then there is our Katie. 17 years old, and a Bantams fan for nearly half her life now. Katie’s first game was August 2007 for the home game with Macclesfield Town that marked City’s return to the fourth tier of English football, and Stuart McCall’s return as manager. Ashley, Chris and Katie share much in common beyond the fact they have never endured Jim Jefferies as a manager, and don’t involuntarily shudder at the words ‘Jason Gavin’. They are passionate Bradford City supporters, largely because the club made it so affordable for them to attend matches in the first place. That Macclesfield Town match was also the launch of the cheap season ticket initiative that was pioneered by Julian Rhodes. Eight years on, the scheme is still with us. And it’s working better than ever. 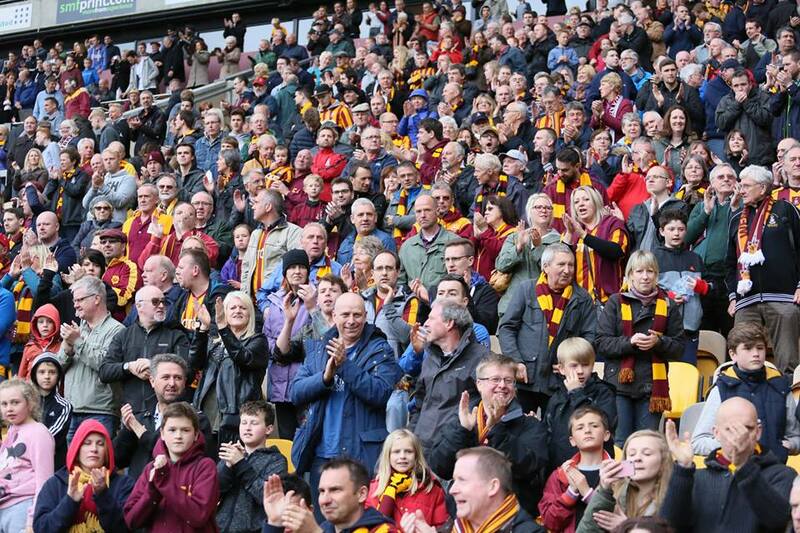 For the 2015/16 season, Bradford City will play in front of a record number of season ticket holders. In total there will be 18,021 of us – to watch League One football. Even back in the Premier League days, the Bantams didn’t have this many season ticket holders (admittedly due to a lower stadium capacity meaning there was a cap on season ticket allocation). It is an incredible uptake and a fantastic measurement of the popularity of Bradford City, who have achieved so many great things over the past three seasons. And it is highly commendable justification for a season ticket policy that has been maintained since January 2007. Back then, the concept was announced by Rhodes with City playing to crowds of around 8,000 – less than a third of Valley Parade’s capacity – and sleepwalking their way to relegation. Some people were barracking the City chairman to walk away from the club. The season ticket idea seemed fantastic on paper, but it was difficult to see it working. Was the price back then – £276 for a season ticket – the true reason for falling crowds since the turn of the millennium, or was it the dismal football? Those of us who stuck by City between 2001 and 2007, we probably all knew of others who gave up and walked away from the club. They didn’t stop coming because they couldn’t afford it, they left because they were fed up. Rhodes’ season ticket offer back in 2007 was akin to receiving a coupon for a free pizza from your local takeaway, after you’d stopped going because they gave you food poisoning. When City were relegated to League Two in May 2007, just before they officially put the cheap season tickets on sale, you suspected the idea would be abandoned. Even at £138, would enough extra people be willing to pay for a season ticket to make up for cutting prices in half? The answer – helped by the lure of McCall’s arrival as manager – was yes. Uptake was above expectations, and crowds of 13,000 were the norm during 2007/08. And though the number of season ticket holders did decline year-on-year up until 2012/13, and though critics argued the club couldn’t sustain cheap prices if they wanted to escape the swamp of League Two, the board stuck with their principles. Prices only crept up slightly, with the 2012/13 price of £199 still making City by far the cheapest team to watch in the Football League and even many non-league sides. All that was needed was success on the field for it to snowball, and since the History Makers season crowds have continued to climb. It’s easy to forget now, but going into this summer we expected a price hike. That with Gianni Paladini’s potential takeover, the days of paying only £199 for a season ticket were over. That even without Paladini, the ambition to get into the Championship would be used to justify a greater hit on our wallets in return for a bigger transfer budget. That with crowds still growing following the FA Cup adventure of 2014/15, the club could get away with driving up the prices knowing people would be more likely to still pay. But instead of a price hike we got a price drop. £149. Rhodes and Mark Lawn had decided that the best way to tap into growing interest in the club is to make it even more attractive to buy into it. Backed by some superb marketing efforts that appear to be the direct influence of James Mason, the initial target of 15,000 was smashed. 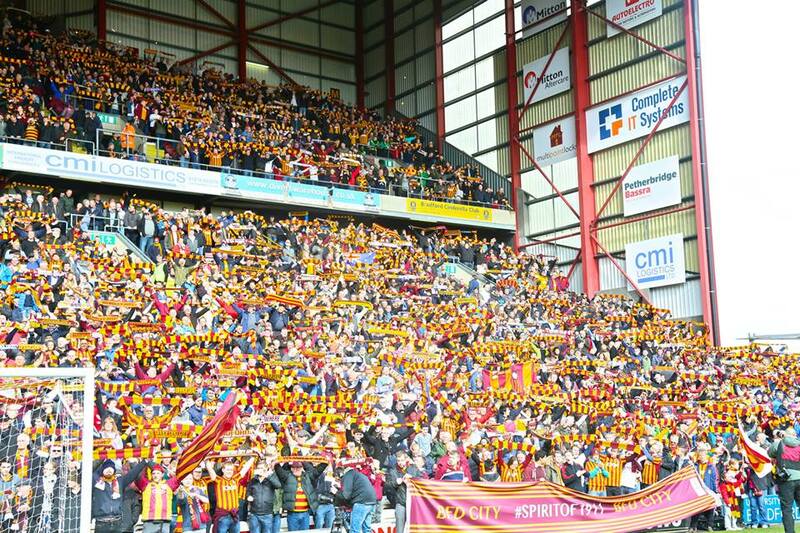 It is amazing to think that, when the likes of Sheffield United and Barnsley visit Valley Parade this season, more than 20,000 supporters are likely to be in attendance. All of that extra ground work done to boost the capacity for the Reading FA Cup game, last March, may be required for more than that one-off occasion after all. But it goes deeper than that. The success of Bradford City’s pioneering season ticket approach is about the stories of Ashley, Chris and Katie. It’s about how a football club on a seemingly irreversible decline – and increasingly unloved by its own city – has reinvented itself and attracted a new generation of supporters. It’s about how Phil Parkinson has built football teams that the city of Bradford can identify and love. It’s about how passionate supporters sing non-stop for 90 minutes, developing an atmosphere that everyone wants to be a part of. It’s about understanding that people in Bradford are not the richest – especially young people – and giving them something that they can claim as their own, and cherish for the rest of their lives. I was part of such a movement in the late 90s. Geoffrey Richmond’s drive to turn the Bantams from mid-table third tier nothingness to Premier League members was as much about affordable ticketing as it was Mark Stallard, Peter Beagrie and co. At 16 years old, I first set foot inside Valley Parade – like Chris – calling myself a Manchester United supporter. I was in my GCSE year at school, and had two part time jobs that amounted to little more than £25 a week in my pocket. And I only had to pay £5 to stand on the Kop every other week to watch Darren Moore, Jamie Lawrence, Nigel Pepper and Edinho. I was hooked, and there were thousands like me. As City climbed up to the top table of English football, crowds tripled over a short period of time. They went from 6,000 to 18,000 because people could afford to come along. Because Bradford City was inclusive, not exclusive. Now, it’s happening all over again. 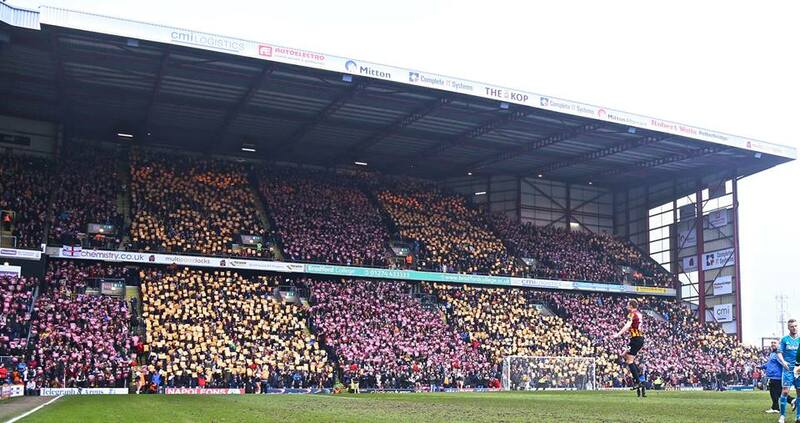 18,000 season ticket holders to watch Bradford City play teams like Crewe, Shrewsbury and Burton. The stories of Ashley, Chris and Katie are developing nicely. They’ve seen the ups and downs (Oldham away was awful to be fair, Ashley) and they’ve made their marriage vows to the club. 18,000 season ticket holders for League One is incredible. What’s even more mind-blowing is the realisation that this does not need to be the peak. Bradford City was just a 1-0 home defeat to Chesterfield away from reaching the play offs last season. This year, with the FA Cup money and 18,000 backers, there are realistic hopes we can really push for promotion. And if it doesn’t happen this season, perhaps it will the year after. We are starting to knock on the door. The Championship is on the horizon. Imagine if City could earn promotion, and then the board stuck with the cheap season ticket plan in the Championship? Even bringing in a small price rise could result in the ground being sold out. Next, we’d be talking about waiting lists for season tickets at Valley Parade. 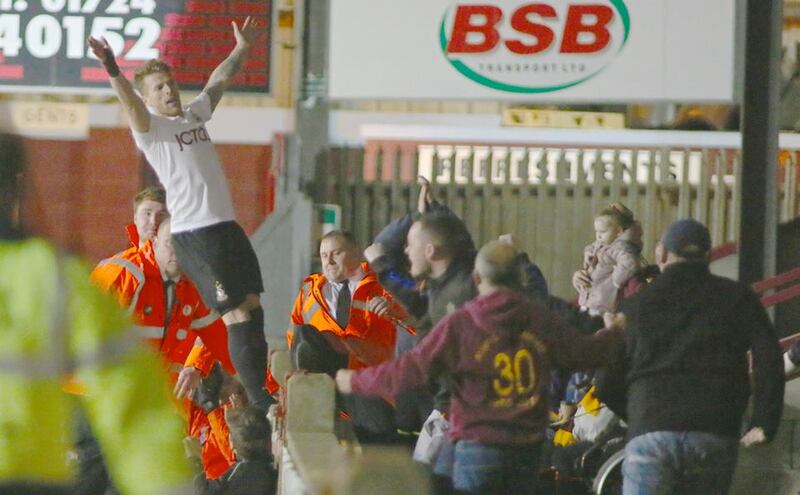 The point is that we haven’t reached the ceiling of what Bradford City are capable of being. A new generation of supporters have been hooked; now let’s start work on the next one. Jacob is one such target supporter. 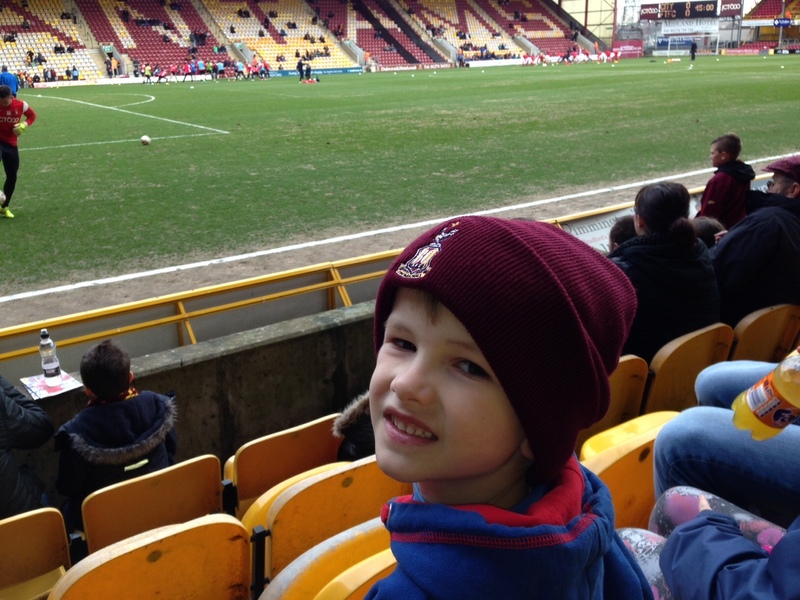 Last season his dad, Matthew, took him to Valley Parade for his first ever football match. With Jacob six years old and having become increasingly interested when Sky Sports is on the TV, Matthew – a Liverpool fan – sensed that the time was right to take him to a game. Jacob came to the Fleetwood match last season. He really enjoyed the experience, especially when City raced into a two-goal lead. And when Fleetwood came back to earn a draw, Jacob was devastated. Matthew tells me of Jacob’s experience, “He had been asking to go for a while to a football match; and after Bradford City beat Chelsea he was adamant he wanted to go and watch them rather than Liverpool. “Jacob absolutely loved the match. I thought he would be bored. I was really impressed how the match kept his attention right to the end. It helped that we had such good seats on almost the front row so he could see the subs warming up in front of us. Plus he loved his new Bradford hat! Even months on Jacob continues to sing Bradford City songs. And when he plays football he pretends to be Bradford City. And more recently he was at a family gathering, where the 80s band providing the entertainment broke into Depeche Mode’s ‘I just can’t get enough’, and Jacob ran straight over to his dad Matthew to exclaim “It’s the Bradford City song”. When I asked his dad if I could feature his story in this article, Jacob enthusiastically drew me this wonderful picture. And if, this time around, City’s back four can do a better job, and if the Kop makes the same level of racket, Jacob might just be badgering his dad to come again and again. And there will be others like him all over the Bradford district. Who want to be part of this. At a time when Leeds United are floundering in the Championship (cheapest season ticket: £398) and Huddersfield Town are banging on the glass ceiling of mid-table in the same division (cheapest season ticket: £295), there is a chance for City to steal a march on their local rivals too. 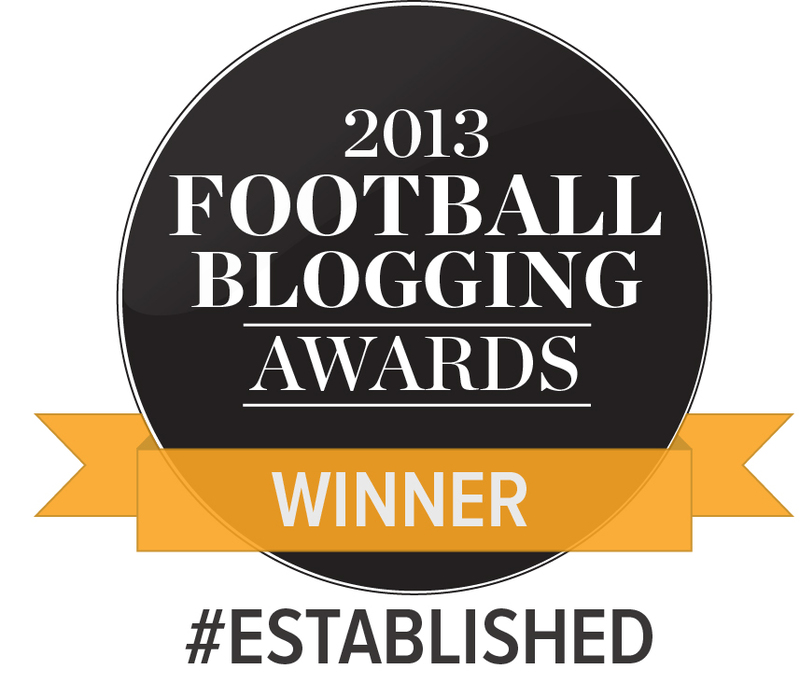 To become the dominant club of West Yorkshire. To drive fan engagement whilst driving up the football ladder. Valley Parade has become the place to be. Football has never been more popular as a sport in this country, and yet never been so expensive to be a part of. Bradford City have rarely been more popular in its community, and yet it won’t cost you an arm and a leg to go and watch them. Shout it loud from the rooftops: it is the very least that the club deserves. This article has just given me goosebumps. An Excellent piece..cannot wait for the season to start. 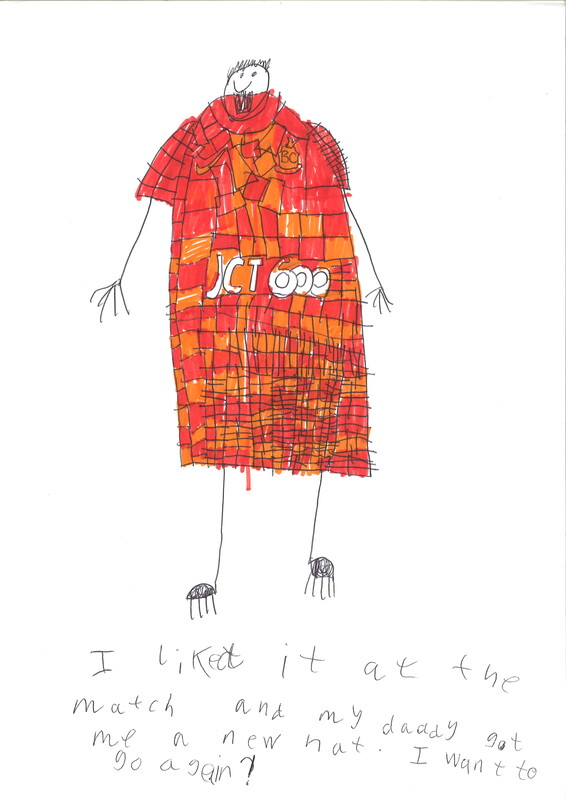 Jacobs drawing should be on T Shirts, I’d buy one. I would too Mark but then I am his dad! This is the type of article that makes WOAP a unique website. One of my best friends who I met 30 years ago this September has a six year old son who I am Godfather to. He took his son to Valley Parade to see several matches last season. When I saw my Godson last weekend he was wearing his Bradford City away strip and started chanting “Everywhere we go”. My brother has two sons and the eldest who already attends games at Valley Parade, drew a brilliant action picture of Bradford City playing Leeds United in my birthday card earlier this year. My brother has also purchased a season ticket for my youngest nephew for next season so I’m sure that the three of them will enjoy being together inside Valley Parade next season. Just a few examples of new and young Bradford City supporters. I’m a Quid a Kid kid. I used to like Newcastle ‘cos they were good. A pack of wild horses couldn’t pull me away from Bradford City now. Great piece. My story is similar to these, my boyz & I looking forward to the new season.